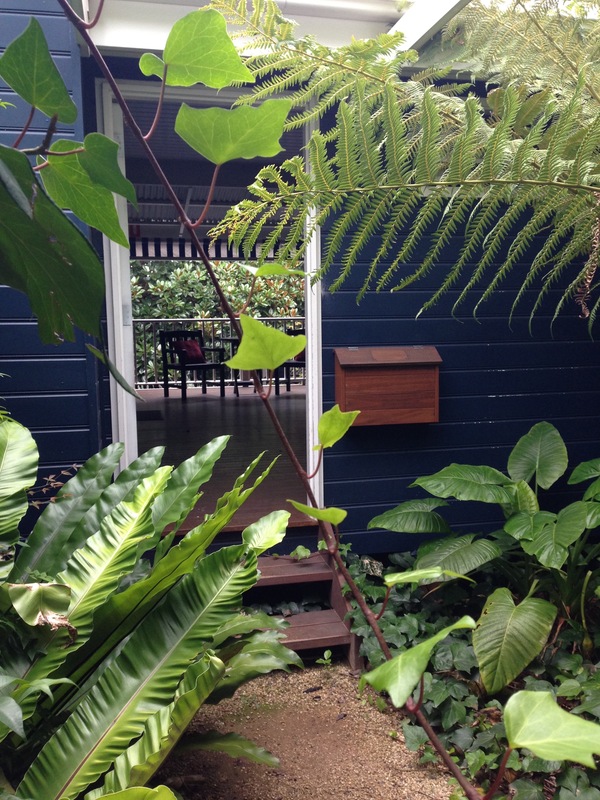 Bells of Killcare, a hotel and restaurant, has some of the best usage of Australian natives I have seen to date. 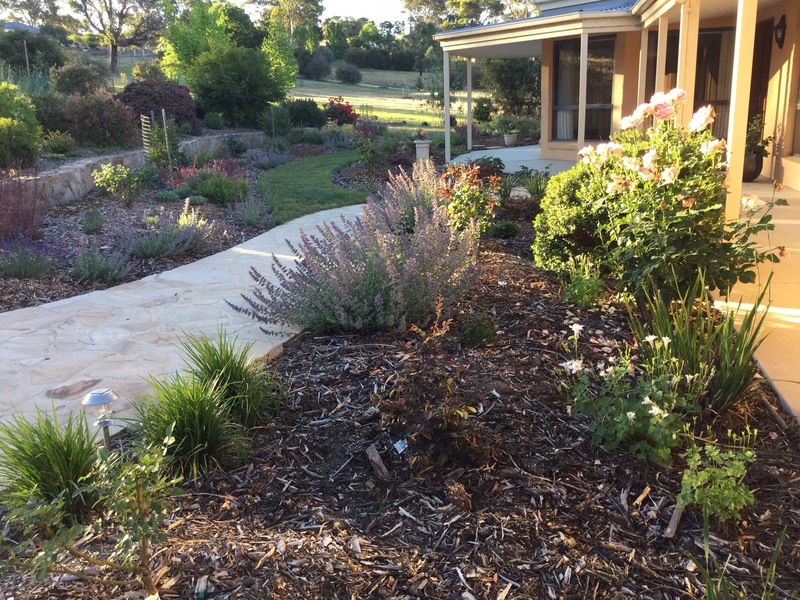 If I am being frank, the surrounding bushland did set off the gardens fantastically, and the circumstances for my visit also perhaps meant that a square patch of lawn would have got me going, but two weeks on, I still think they were pretty impressive. See what you think. I’m going to take you through the gardens examining why they worked so well and use the framework I put up a few weeks ago, to help make the ideas translatable for the small garden. The tricks I believe you need for high impact natives encompass i) colour, ii) contrast and iii) fullness. Morning light catching the glossy texture and beautiful tones of this lilly pilly hedge – a view taken from the breakfast table at Bells! In the more formal areas, close to the buildings, bright colours have been chosen which sit comfortably with the lawns and exotic plants. 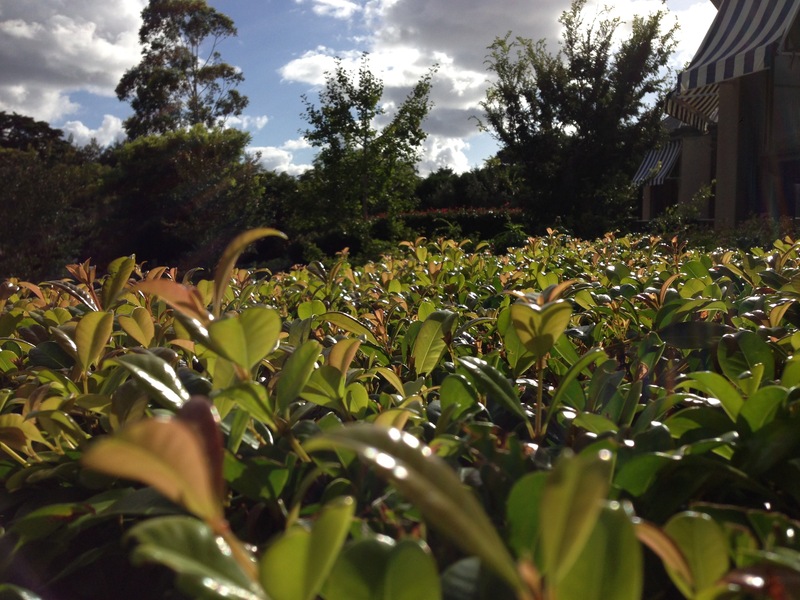 Lilly pillies (Syzygium and Acmena) are wonderful shrubs for blending with exotics, with generous, glossy leaves and tints of pink, red or orange in their leaves and berries at different times of the year. 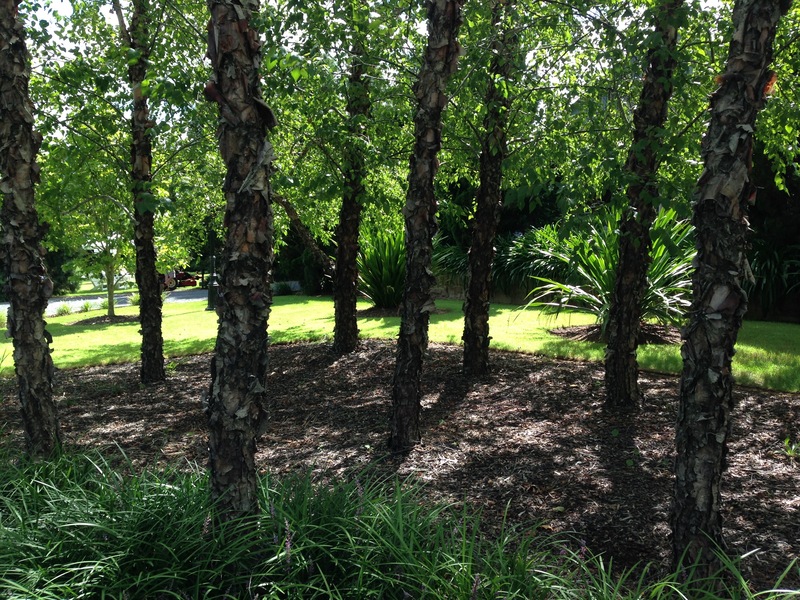 The gymea lily (Doryanthes) is another very bright green native, which, in its own neat bed, looks just the part alongside this birch grove, adding structure, focal points and a subtropical feel. In the areas closer to the bush, more subtle colours have been chosen. The soft grey of the Helichrysum and the matt, dark green of the oleander. It all blends perfectly. Enough connections between the plants for cohesion; enough contrast for holistic interest (and it looked even better when the sun came back out!). 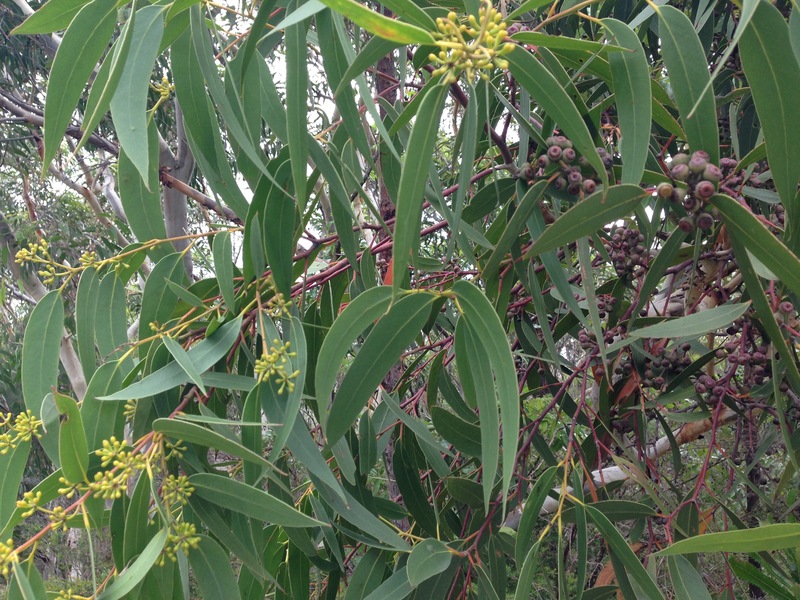 A lot of natives have small, fine, matt leaves which can look drab en masse. Mixing the finer textures with bolder textures creates wonderful contrasts, with both types looking the better for it. 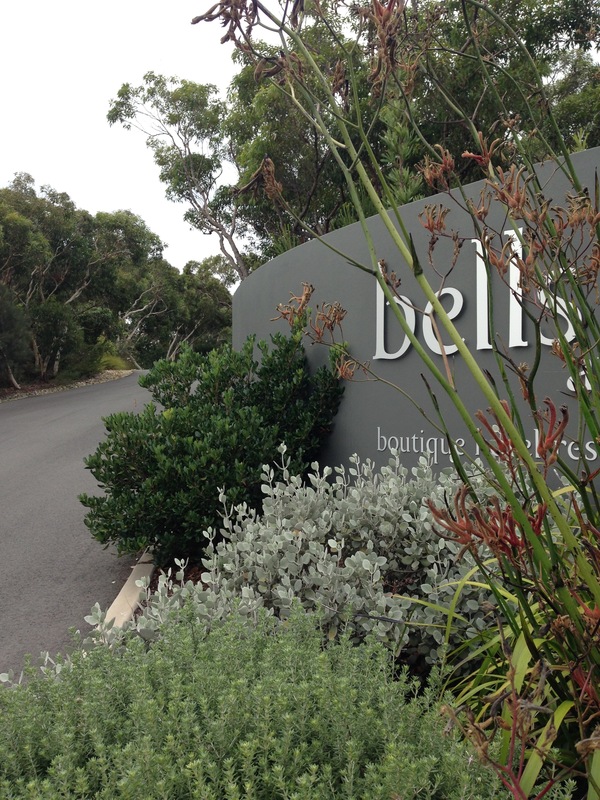 This fabulous mix at the entrance to Bells has the linear foliage of Anigozanthos (Kangaroo paws), round foliage of Rhaphiolepis, and divided foliage of Grevillea. Even with the roo paws going over, the foliage mix is really quite striking. And above, again, our friend the Gymea lily shows just what it can do mixed with natives as well as exotics. 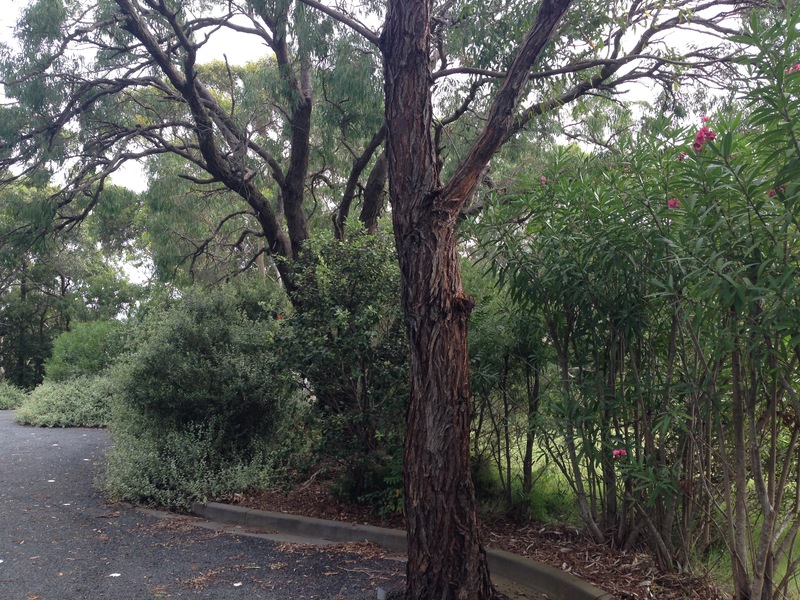 Here it brings structure and life to the divided Grevillea and fine Leptospermum foliage. We also shouldn’t forget that there are plenty of large leaved natives, particularly for shady spots, where moisture loss is not so rapid. Above we have Asplenium (Bird’s Nest Fern), Alocasia (Elephant’s Ears) and Dicksonia (tree fern); wonderfully contrasting textures and forms. To me, a garden which is full is a happy garden. It’s fine to see soil or mulch when things are newly planted, but after that, I want to see plants jostling and fighting for space. The abundant look, with each square centimetre heaving with life. Above, you can see how plants are placed to fill every patch of soil and each plant seems to be thriving and healthy. It’s not only a good look, it also keeps weeds down and protects the soil from sun damage. It’s just a no brainer to me. 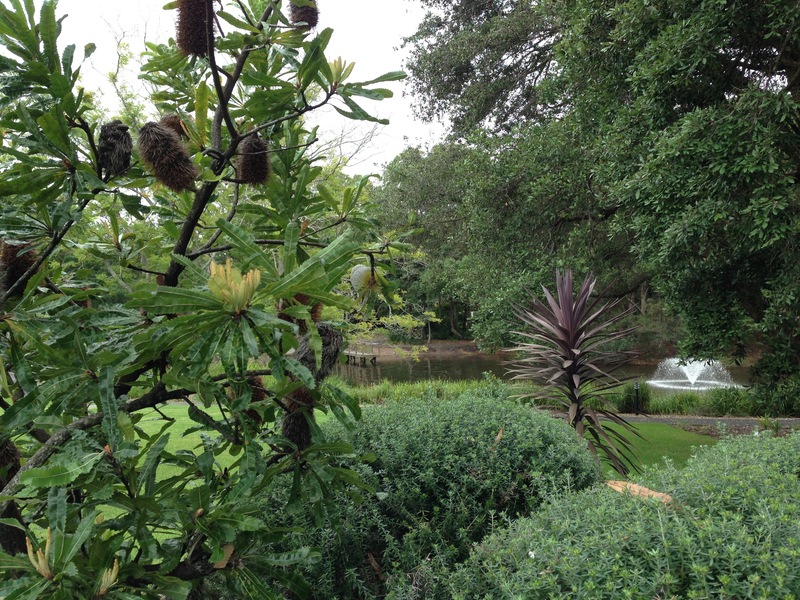 Banksia, Westringia and Cordyline at the lake at Bells. I didn’t like the Cordyline at first, but it is growing on me. The shape does mirror the fountain behind and the colour links well with the Banksia seed heads. What do you think? Perhaps it needs more than just the one plant, or perhaps I have just seen one too many bad, spiky gardens in my time! 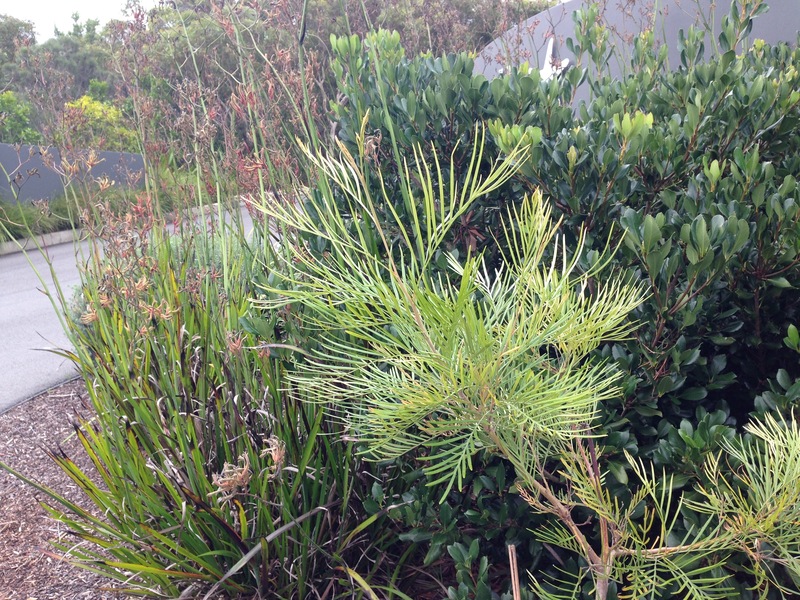 And again, tightly clipped Westringia provide contrast to the Banksia; all space is filled. 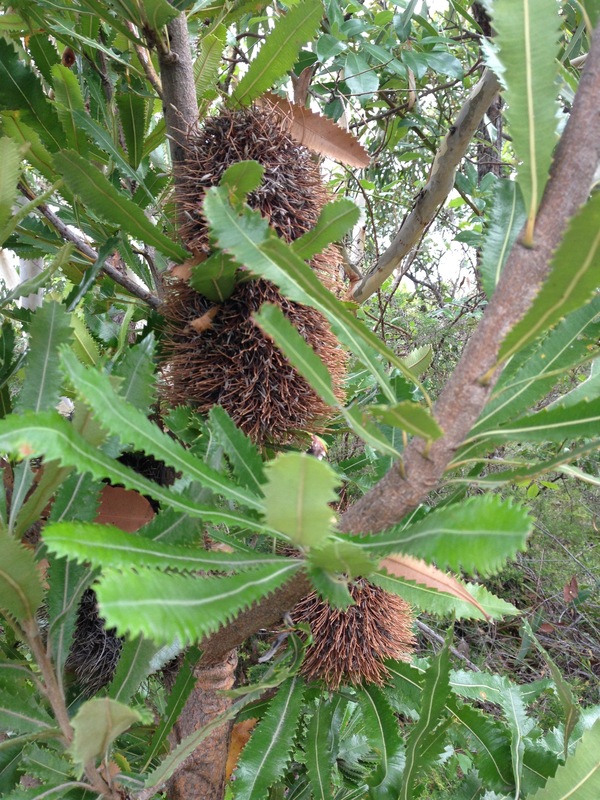 I do love Banksia near water – it reminds me of a classic Australian beach scene. One last photo, which I did show two blogs ago, but I think is so good, so full of just the right colours for the surrounding bushland, so full of contrasting textures and forms, and so, well, just full, and of healthy plants at that, that it deserves one final viewing! Very low maintenance but absolutely perfect for that spot. I’m going to keep going with my ‘plant natives’ campaign. 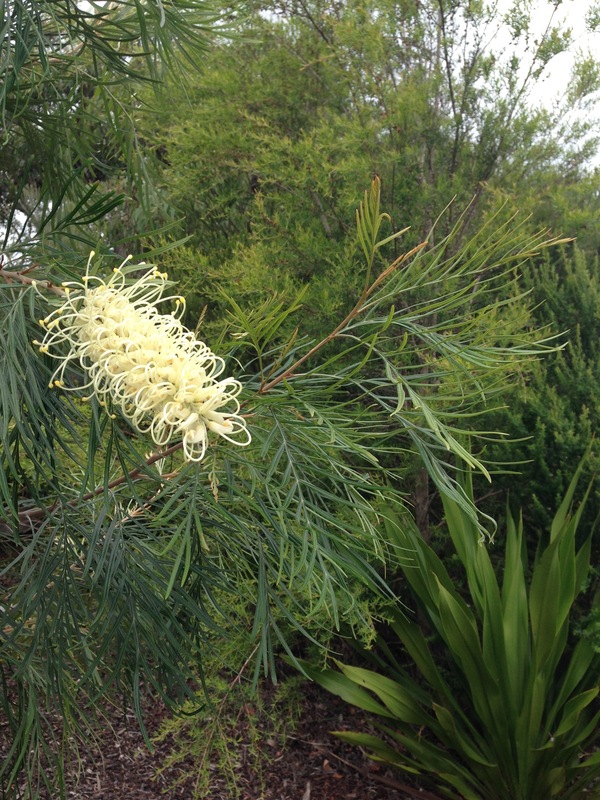 Generate that Australian sense of place in your garden. If it’s bold and beautiful and it ‘fits’ with your region, you’ve just got your own personality to add and you’ll have the perfect garden! 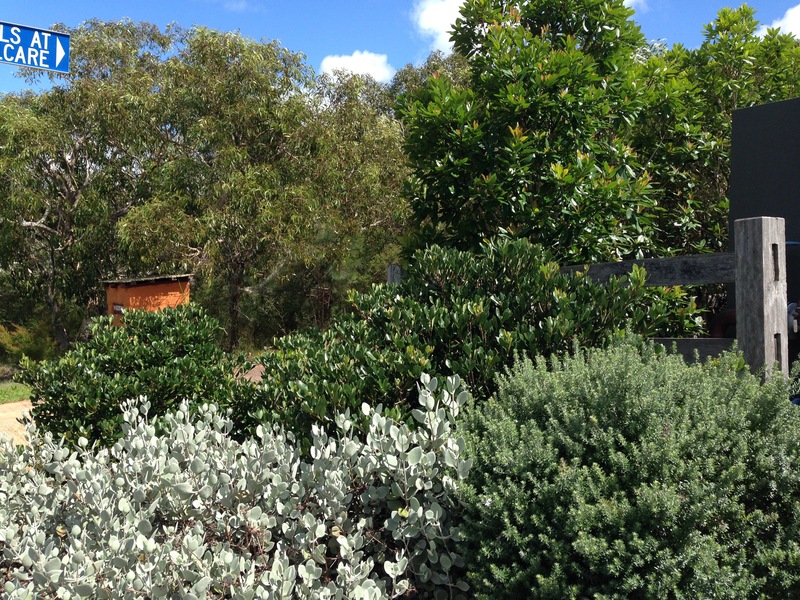 I agree Janna – we can mix natives and exotics the Helichrysum (I presume petiolare?) and Oleander, although not native, look great in the setting amongst the native trees. I used native grass i.e. Poa ‘Suggan Buggan’ and grass like plants such as Lomandra ‘Crackerjack’ and L. ‘Lime Tough’, Dianella ‘Little Rev’, plus Westringia ‘Jervis Gem’ to rune into balls and Pittosporum ‘Golf Ball’ (no need to prune it does it all of its own accord, W. ‘Naringa’ to form a narrow hedge and as a backdrop to a new driveway planting – no need to prune this one either it produces thick growth and only grows to about 80cm wide or so. These natives are used in amongst red and purple flowering Salvias, a small variety of the purple S. leucantha, Calamagrostis ‘Karl Foerster’, Yellow Pokers, Geum ‘Tangerine’ and a particularly lovely deep purple leafed Euphorbia with a very rounded habit, which was labelled ‘Chameleon’ (but isn’t), that flowers bright lime in the winter along with the tangerine geums. And to finish off – 2 established and beautiful Cedrus deodara at one end and a blue leafed conifer (not sure of the variety) at the other, along with 3 purple leafed (young) Acer ‘Crimson Sentry’ eveny spaced through the middle. The bed is about 30 metres long and 6 metres wide (wider in spots). It is a young planting, only done 5 months ago, but it seems to work – the forms and textures are pleasing to the eye too. I have always used natives in amongst my borders and more people should too I think – they are tough and reliable. I’m glad you feel that way too and are encouraging others. 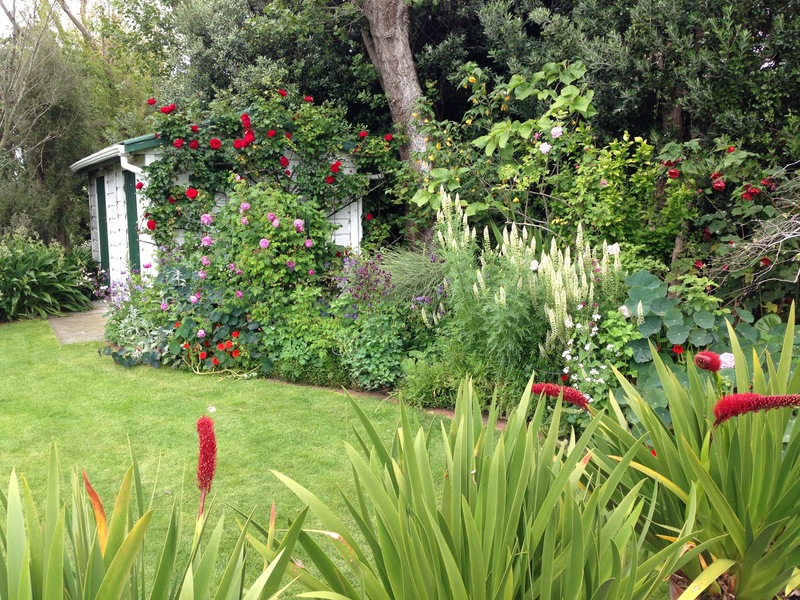 Loved your blog on this wonderful garden. Gosh, I really do need to see your garden! It sounds wonderful. I also think Salvia is a gem – flowering for so long, putting up with our climate and mixing with natives and exotics equally well. Just so many planting mixes I’d love to have, so little space to plant them in! Oh and yes, I’m pretty sure it was H. petiolare. Just so good with natives. An interesting post and I like the way you have created a template to talk about the garden, I might just do something similar for the gardens I am visiting later in the year if you dont mind? Hi Helen. Thanks for your comment. I am so pleased you have got an idea from one of the photos – hearing this is what makes blogging fun! I agree, texture is important and also often the overall form of a plant is noticed just as much as, if not more than, the form of the individual leaves, when viewed as part of a composition. I’m glad you liked the template – I look forward to reading about those gardens later in the year! I read this post yesterday and despite it still being quite hot I had to rush outside to examine my garden and see if it “ticked boxes”. My head was swimming with your terms…colour…contrasting form and texture…health and fullness…bold…fit…character. Arrrgh! I had to get husband for a second opinion. It was past ‘wine-o’clock’ so with red in hand we traipse outside again to analyse my gardening efforts. He assures me it ticks boxes…in parts…and I do have to agree with him. However, by the time we finished the second glass of vino while sitting in the arbour all was looking MUCH better. I was so inspired I went and dug up an Acalypha! It had long outgrown the spot where my dad planted it almost 40 years ago (it’s found a new location). Said spot definitely does NOT tick boxes but I have a plan…colour, contrast, bold…yep…got it! Janna, I love your blog and have become a total addict. I also look forward to reading comments from Adriana and others. Will I end up with a better garden? Who knows, but I’m having great fun with the process and for me this is one of the most important elements of gardening. Oh, Suzanne. You made me laugh (your poor husband). You made me cringe (all that jargon I come up with). You warmed my heart. I am so pleased if I can help add some fun to gardening but I’ll get addicted to comments if I’m not careful, so you had better stop being so nice! Thank you for joining me so enthusiastically on this new blogging journey; I just love the interaction with like-minded people that it prompts. Janna, thank you so much for analyzing and sharing the elements needed for a beautiful garden. As time goes on, I develop more and more of a love of Australian natives. 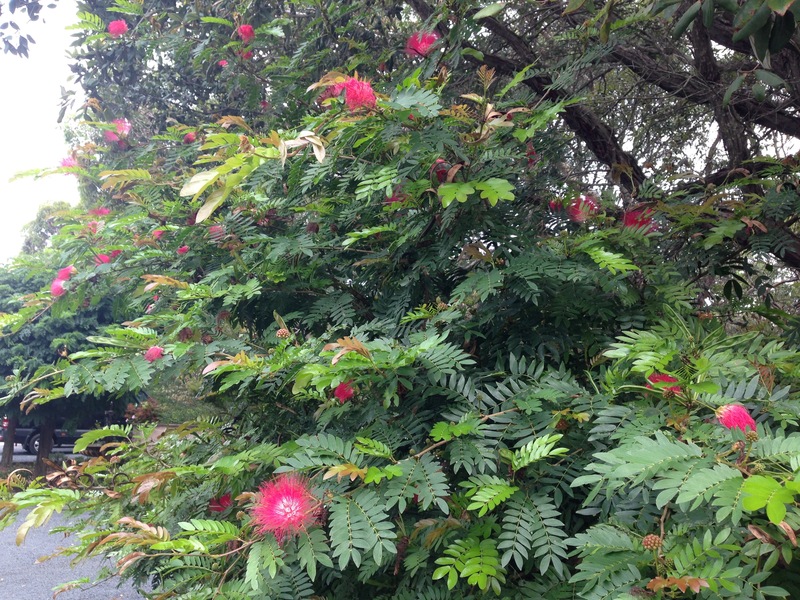 Banksias make me melt. I’ve planted quite a few natives, but they are growing achingly slowly, and it’s certainly not a full look. Sometimes I give in and plant things very close together, but somehow that doesn’t look quite right either. Thanks ever so much for your comment, Sue. It is interesting how natives ‘get you’ over time. I agree, it isn’t easy to create the full, lush look but we can see it is possible! I think the biggest trick is choosing the right plants upfront. We have only been breeding natives for a few decades, whereas the likes of roses have been improved over centuries. It does mean there are a number of ‘dud’ ones that come and go and that more trial and error is required, but more and more dense and compact cultivars are being produced now. Maybe I will write a blog suggesting some good species and cultivars.